Leonardo again – and the Bank of America? Banks are not well-loved, these days, for reasons that are familiar to all of us. But here’s a story that shows that even banks may on occasion exhibit a social conscience and an artistic sensibility. The article below is a fragment (in free translation) from a longer article which has appeared on the Corriere della Sera, the newspaper of Milano. The Codex Trivulzianus, one of Leonardo da Vinci’s earliest manuscripts, part of the collection of the Biblioteca del Castello Sforzesco in Milano, will be restored. The Bank of America Merrill Lynch Art Conservation Project will finance the restoration. This will not be the Art Conservation project’s only enterprise: 20 works of art and artifacts of great cultural and historic value, gathered from 19 countries, have been selected for restoration. DIGITAL RESTORATION – The Trivulzian Codex, a collection of Leonardo’s drawings and writings, is comprised of 55 folios dated between 1478 and 1490, and it is one of the most significant documents of the Italian Renaissance. It is a unique testimonial to the eclecticism of the Italian artist/inventor: it contains notes, drawings and studies of religious and military architecture (amongst which a sketch for the cupola of the Duomo di Milano), but also analyses of the Italian language and observations on the literature of the time. 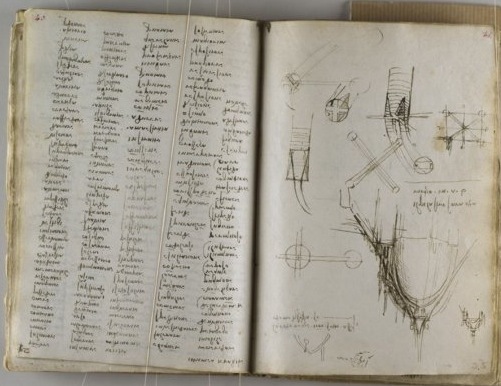 Using cutting-edge software capable of producing virtual copies of Leonardo’s technical designs, the restoration project will result in a digital version of the manuscript which will remain impervious to the passage of time and will facilitate academic research, while rendering it more accessible to the lay public. So, kudos to the Bank of America, and never mind the tax writeoffs they will take. They are doing a good thing for all of us.